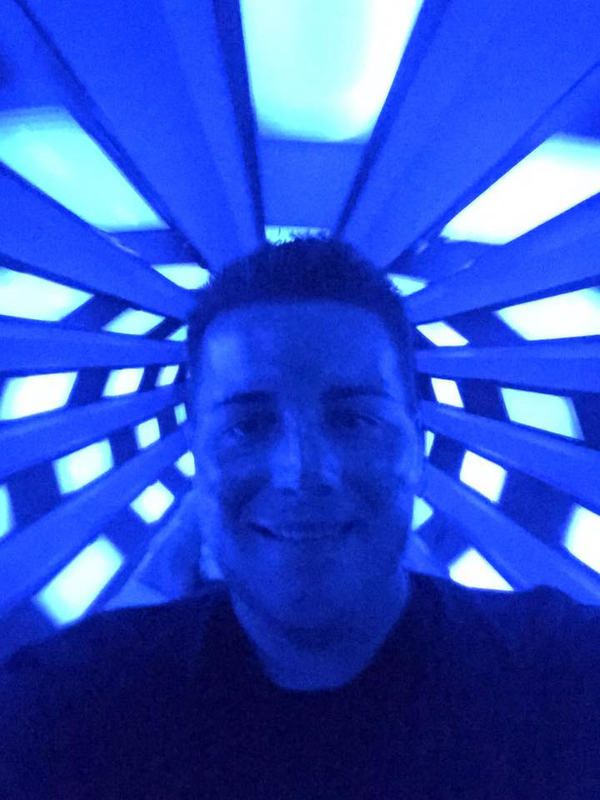 "The future River Ride promises to be as enjoyable as it is informative. An early concept has visitors boarding a "cruise boat" for a simulated ride down the Rhine and other rivers, the trip affording a visual impression in miniature of the cultural heritage of Germany's past and the highlights of its present. 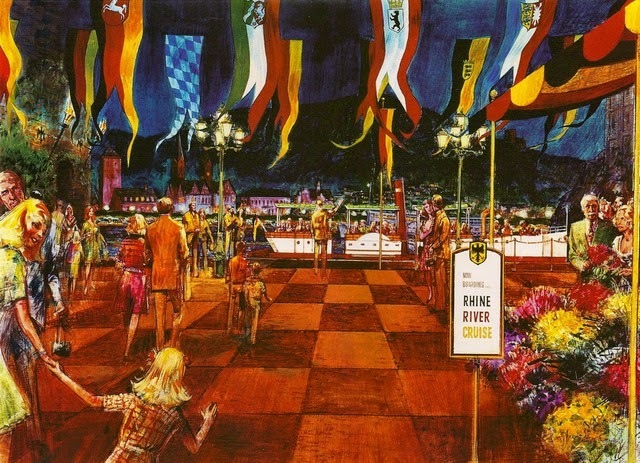 Among the detailed models envisioned are scenes in the Black Forest, the Oktoberfest, Heidelberg, the industrial Ruhr Valley . . . the possibilities are limited only by the planners' imaginations." 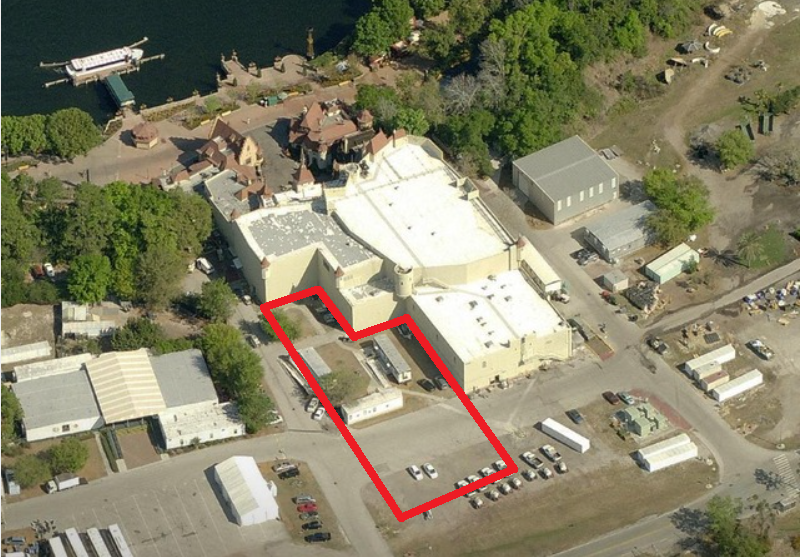 This arrow shows the planed entrance to the attraction. 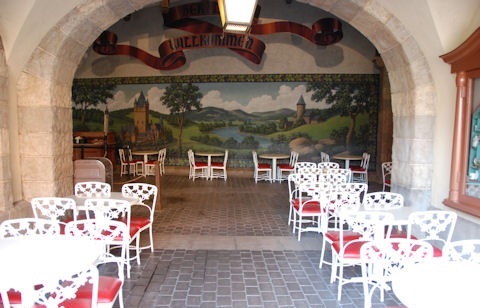 Wooden doors can be seen in early photos of the Germany Pavilion which were to be the entrance to the attraction. 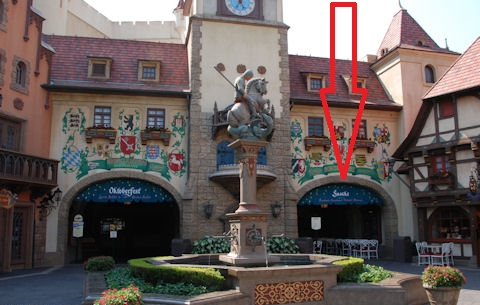 The arrow above shows where the entrance to the attraction's queue would have been. Wooden doors would have greeted guests as they entered. Today, the wooden doors have been replaced with a large mural that you can see below. 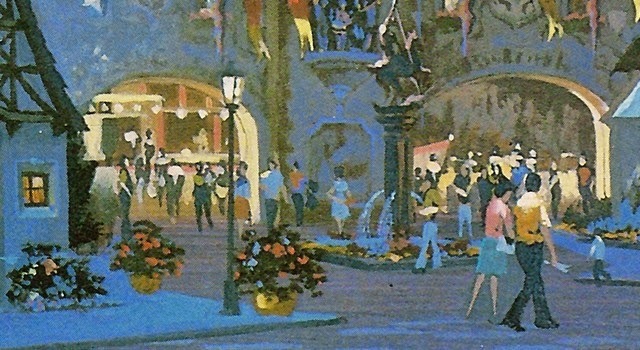 Upon entering through the wooden doors, guests would enter a grand foyer, similar to what you use to see inside Maelstrom, that would serve as the queue and loading area. A concept photo below gives us an idea what this might have looked like.
" ... a cruise down Germany's most famous rivers -- the Rhine, the Tauber, the Ruhr and the Isar. Detailed miniatures of famous landmarks will also be seen, including one of the Cologne Cathedral." A close up of the ride vehicles and boarding area. 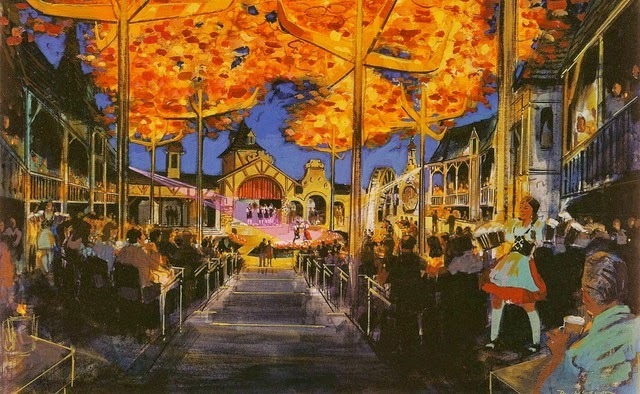 Passengers would all be facing one way, towards the right, and be seated on the same side of the ride vehicle. 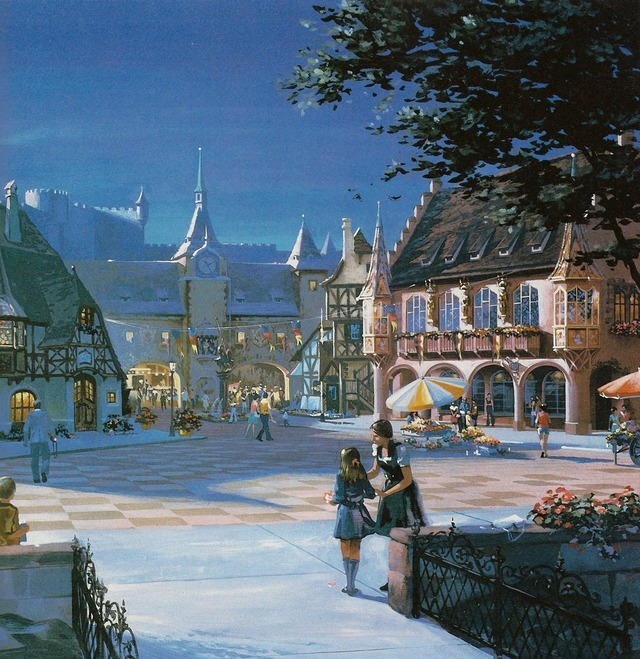 The show scenery would all take place on one side of the attraction and all show scenes would take place directly to the front of the guests leaving nothing besides lighting and dark walls behind them. By doing this, Imagineers ensure that passengers will see exactly what they intend for them to see. Also, this would allow the designers to keep costs down and save on space. Blueprints for the Rhine River Cruise showing loading area, track and unloading area. 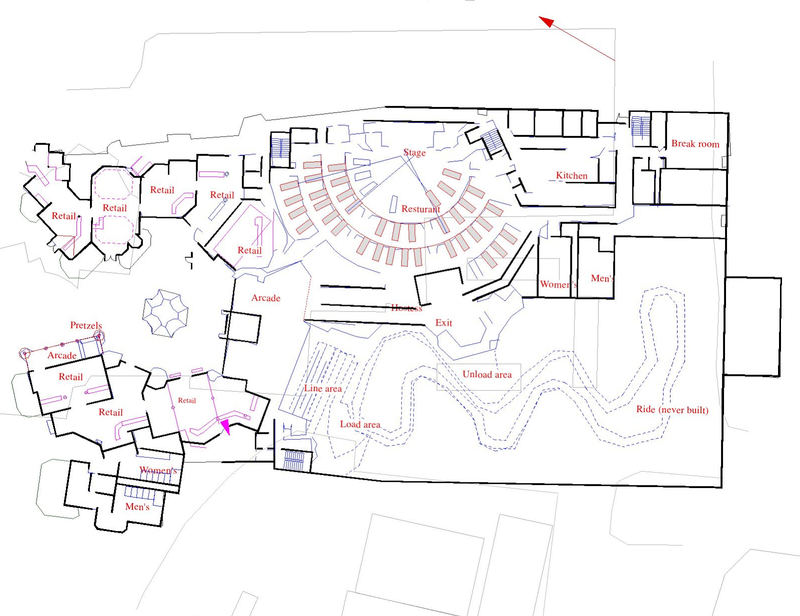 The area in red represents where the show building would have been if built along with the pavilion. P.L. Travers Recorded Discussing "Feed the Birds"